I wanted to go out for brunch for some time now. The past few weeks flew like blur and this past weekend, I finally slowed down to enjoy some overdue free time. At Valerie’s request, she asked for a brunch that had salad options. Now I always been that shameless carnivore and I usually go for Eggs Benedict preferably with bacon sitting prettily underneath a perfectly poached egg. So all my go-to brunch places I shelved and I searched for a restaurant with the healthier-yet-tastier options. The moment I saw images of the food they serve at L’Ouvrier for brunch, I knew I had to go there. Their salad plates were too photogenic for me to resist. For the first time, I actually ate a salad for brunch! Meeting Valerie Saturday morning, we walked in the restaurant close to noon. I was pleasantly surprised that there were available tables. Just like the images I saw on several reviews, the restaurant has an airy feel, white and light just like the spring morning that I waited so long for. With a big window on the street side and high ceilings, minimalist curated decor adorned the walls, just being in the space lifted my spirits. I loved that the space was amply big to have good distance between tables. The noise level I appreciated as I didn’t have to exert too much effort to hear or be heard. It was a place that could really sustain a relaxed conversation. As we took to our seats, I waited for Valerie to choose one of the four salads that were in the menu. 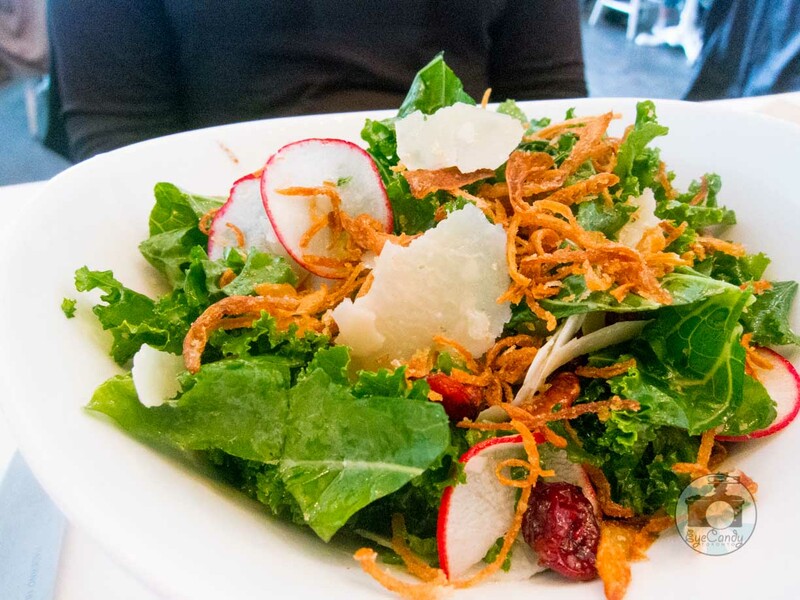 I had my eye on the Kale Salad that was tossed with dried cranberries, radish, parmesan, pecans, crispy shallots and cider vinaigrette or the beets & arugula salad mixed with candied pistachios and dollops of whipped chevre and balsamic reduction. In my mind each salad would be a feast for the eyes. Telling me that she often adds beets to her salad, Valerie opted for the Kale salad offering of L’Ouvrier. I happily went for the beets & arugula and asked for house-cured bacon on the side. Ah well, I really just cannot do without bacon for brunch. Especially when I read countless times how good their bacon was. We also both asked for coffee and L’Ouvrier served it on a french press to be poured in dainty mismatched cup and saucers. From the level of detail and whimsy I have seen, I could almost taste how that meal was going to be. The wait was not long and I finally saw the salads daintily plated in front of me. I was happy with my choice and it was as photogenic as a food photographer would want it to be. It was almost heartbreaking that I don’t have my studio equipment. As I finished taking pictures I finally tried the salad and its flavours was as amazing as how it looks. The beets have a tart and mellow earthy taste which was in perfect harmony with the bitter tones of the arugula and the saltiness of the whipped chevre. I love the bursts of texture coming from the candied pistachios as I took in the perfect bite, having all components of the salad on my fork. I ate everything on the entire plate, of course with bites of the bacon that I had on the side. And I do agree with everyone’s praises about L’Ouvrier’s bacon. It was crisp with the perfect savory taste as what every bacon should be.